Whether you are a carefree child or a stressed out adult, sometimes it is fun to let your imagination run wild and wonder about the unlikely and the improbable. For example, many people imagine what it would be like to win the lottery and fantasize about all the lavish things they would buy and all the exciting places they would go. For others, they like to imagine what they would do if they ever got the chance to meet their favorite celebrity, or maybe what it feels like to throw the game winning touchdown at the Super Bowl. And for some, they may choose to take a slightly more morbid approach, which heavily involves imagining what they would do on their last day on earth. Although for some this may seem a bit macabre, in reality, it is quite normal, and in many ways healthy. Speaking personally, I can recall more than one occasion when I have wondered what I would do if I only had one day left on earth. Who would I call or want to see? What things would I do and experiences would I want to try? And while those elements of what I would do have certainly changed over the years, there is one constant that keeps popping up whenever I imagine my last few hours on earth – food! It can be fun to imagine what you would want your last meal on earth to be, however, as is the nature of nature, most of us don’t have much say in when it is our to time to go, let alone have the ability to plan for it. However, while we aren’t here to judge the moral or ethical implications of them, there are one group of individuals who do in fact know that their end is near, and those are death row inmates. And perhaps one of the most famous things known about all death row inmates that they receive the last meal. The last meal for those about to be executed is a custom that started pre-modern Europe. The belief was that if the prisoner is given a final meal, he will be at peace and not come back to haunt as a ghost. While it can be easy to imagine what we would choose as our last meal, few of us (hopefully) will ever be afforded the chance to know exactly when it is our time to go. However, looking back through history at some of the last meal requests of criminals can often shed an interesting, if not only humorous insight into the mind of these men and women. So before you begin, take a moment and think about all the meals you have had in your life and which one stands out among the rest. Is that what you would choose? And how does it stack up against these other, sometimes outrageous but all too real last meal requests? If you are anything like us, then by the end of this article, you may be tempted to rethink your selection. When it comes to just about anything in this world, people will often associate names of individuals to their respective notoriety. For example, it is impossible to think of basketball without thinking of Michael Jordan; it is impossible to think of Hockey without thinking of Wayne Gretzky, and it is impossible to look at murderers without looking at Ted Bundy. Bundy was charged and convicted of the murder of over 30 people, maybe more, and was eventually executed in Florida in 1989. 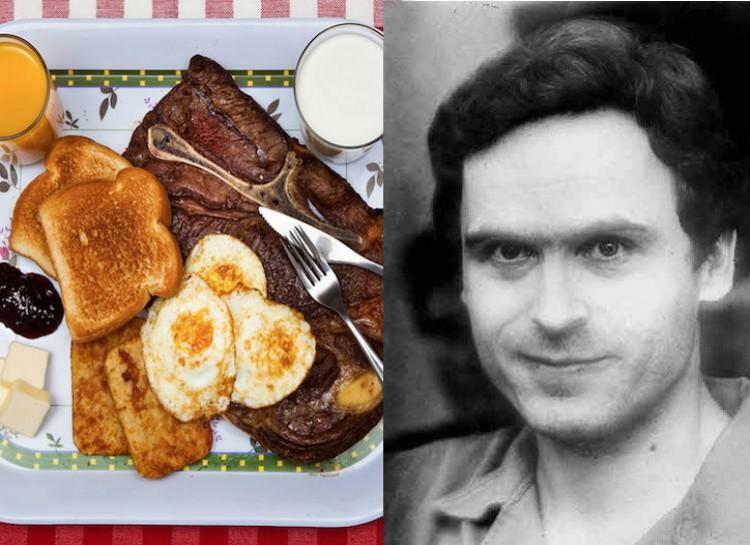 In typically Bundy fashion (which is a difficult one), he refused to make a request so the state provided him with the standard steak, eggs over easy, toast, hash browns, milk, coffee, and juice. However, he refused to eat any of it, but given the nature of Bundy’s horrific crimes, we don’t think anyone lost any sleep over this man going a little hungry.